To start a new sale simply click on New Transaction located at the left top. New Transaction is default to takeaway transaction. 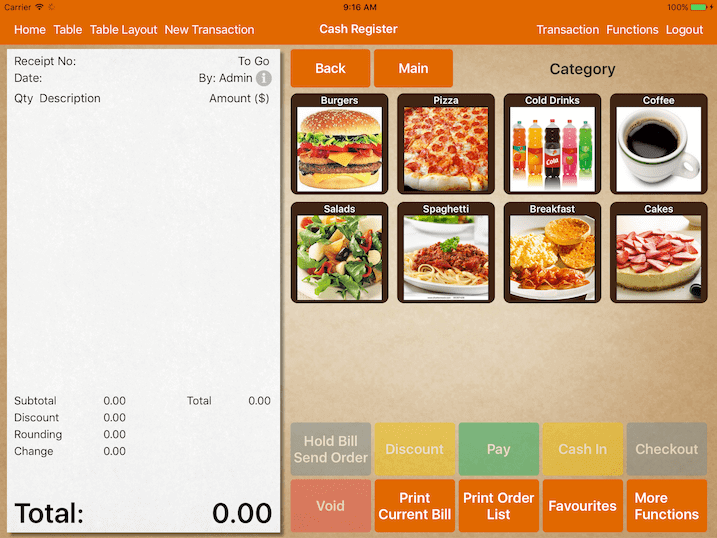 To start a new dine in transaction, select Table or Table Layout to assign a table. Orders punched in will appear in receipt on the left immediately. Orders will be sent to kitchen after Hold Bill/Send Order, Pay or Checkout is clicked. Orders that are not sent to kitchen will not be registered in the transaction. The simplest and fastest way to close a sale is to click on the Checkout button. 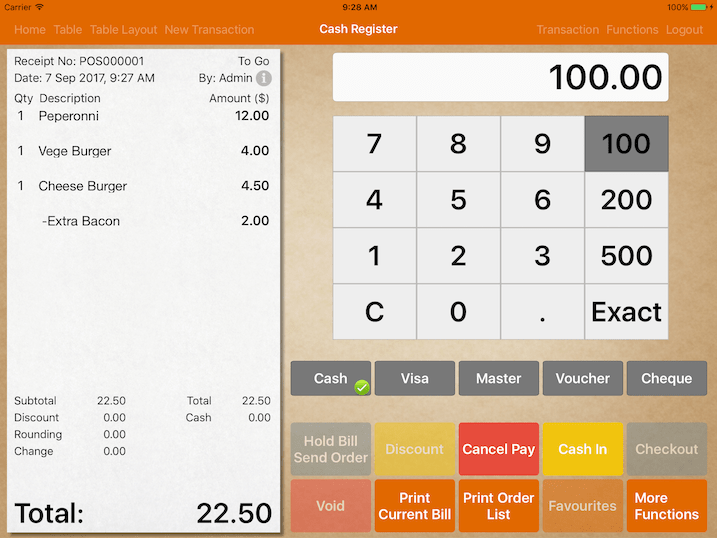 It will prompt you to close the bill with the exact amount and default payment type. 1) Click on Pay button. 2) Select the payment mode. 3) Enter the amount received. 4) Click on Cash In. 5) If the amount received is sufficient for the bill, Checkout button will be enabled. 6) Click Checkout to close the bill. To close a bill with multiple payment type. Upon cashing in, select another payment type, enter the amount received and cash in again. Receipt printing can be turned off or on when needed. 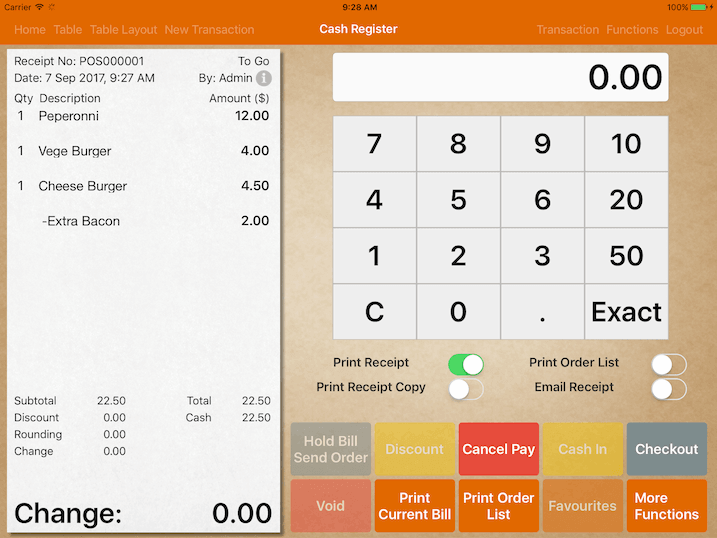 To turn off receipt printing, toggle the switches that will appear on step 5). Setting is saved permanently and will apply for the next transaction as well. To email your customer the receipt, turn on Email Receipt. Default keypad number 10, 20, 50 can be changed. Simply key in any amount that you preferred in the number pad, then click and hold on any one of the 10, 20 or 50 number. The amount you keyed in will overwrite the keypad number.